Geoscience Research Institute | Was There A Great Genesis Flood? The first book of the Bible states that following a recent creation by God, there was an astonishing worldwide Flood. In that context, the Flood would have been responsible for most of the great fossil bearing layers of the earth. However, current scientific interpretations propose that these layers slowly accumulated over billions of years thus allocating more time for the slow gradual evolution of life. The difference between these two models could hardly be greater. Figure 1 illustrates the contrast in interpretations. 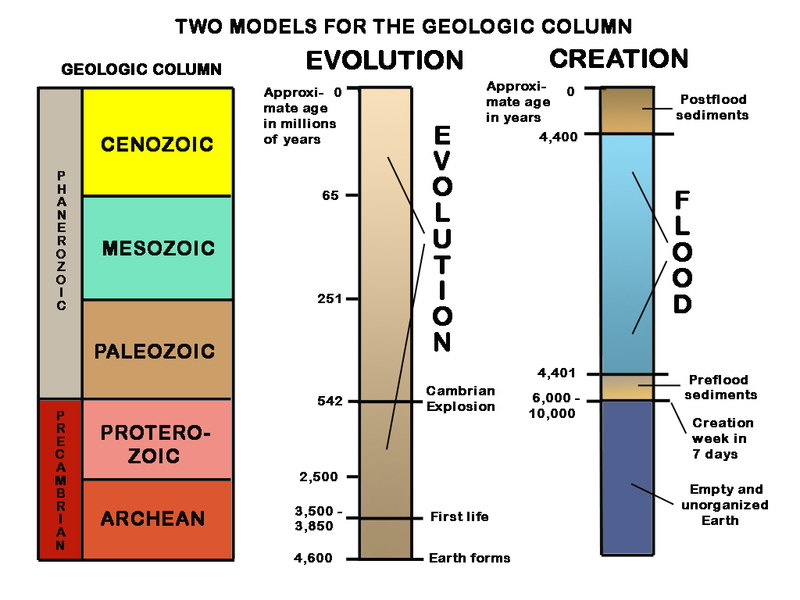 The main divisions of the stack of rock layers covering our earth, called the geologic column, is shown to the left; the evolutionary interpretation of those layers in the middle, and the creation model to the right. Note especially that the evolutionary model is about one million times slower than the biblical model. Which model is true? They cannot both be right! Interestingly, one does not at all have to go to the Bible in order to find the concept of a worldwide Flood. [i] That idea is overwhelmingly dominant in the folk literature of the world. The number of references from that literature for different kinds of worldwide past calamities is listed in this Table, and shows that flood stories are six times as common as any other kind of past worldwide catastrophes. The most likely explanation for such pervasiveness is that the Flood actually occurred. While the scientific community overwhelmingly rejects the biblical account of a worldwide Flood, a significant amount of scientific data fits better with that account than with a model of slow development over billions of years. In considering the scientific data, we are especially interested in sedimentary rocks. They are the dominant ones and water is usually involved in their deposition into sedimentary layers that often harbor fossils. Geologists usually group these layers into larger units called formations. Many of the formations on our continents are incredibly widespread and tend to be of somewhat even thickness. The contrast between these huge unique flat sedimentary deposits and the dominantly irregular topography of the surface of our present continents is striking. There is no way, under present conditions, to spread such sedimentary deposits, which are relatively thin, over major parts of our present continents. Very flat surfaces are required to start out with, and major forces are needed to spread the sediments over such huge areas. Some of these deposits are conglomerates[ii] that required very high energy transport over very wide areas. 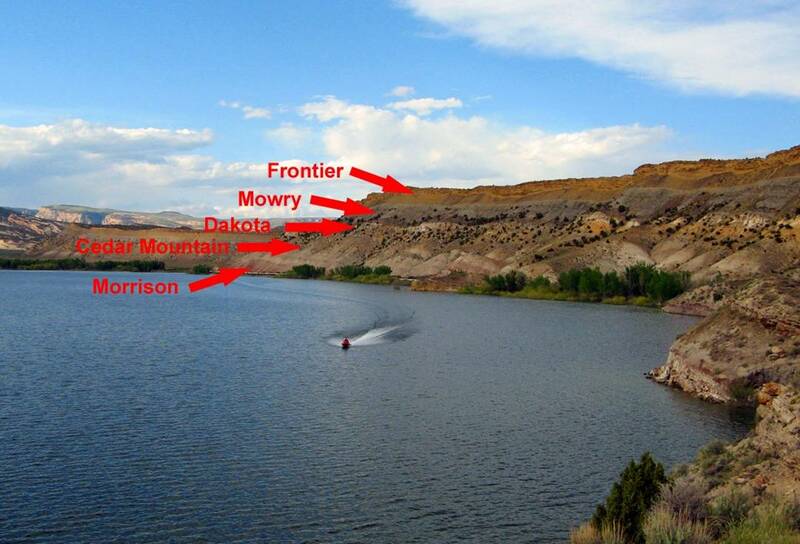 The arrows in Figure 2 point to five formations in the western United States. 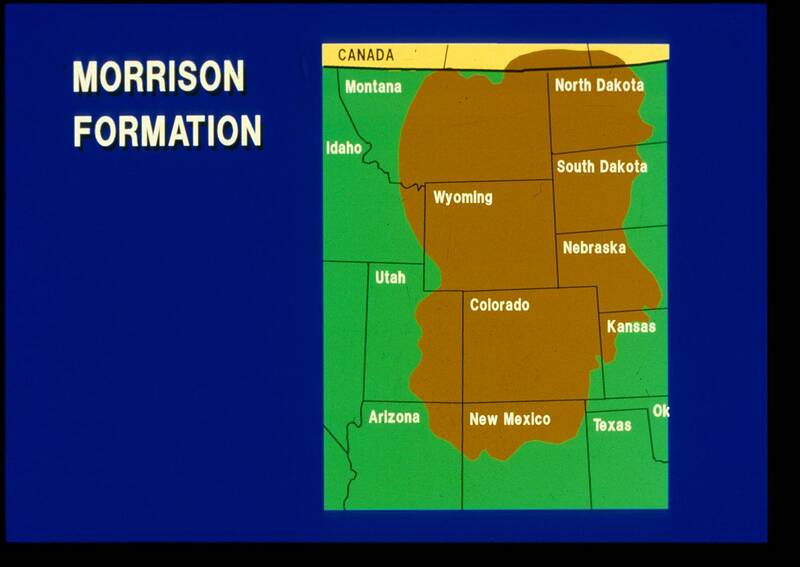 The surface area of each formation in square kilometers is: Frontier 300,000; Mowry 250,000; Dakota: 815,000; Cedar Mountain-Burrow Canyon 130,000; and Morrison 1,000,000. This latter formation extends from New Mexico into Canada (Figure 3). This is data that is very much more like what would be expected from a worldwide catastrophic Flood, as layer after layer of sediments were quite rapidly and extensively deposited on top of the other. It is not what would be expected for deposits formed slowly by ordinary localized geological processes over billions of years, as now generally postulated by the geological community. It is not just the geologic formations that are widespread, but within these formations you have smaller units, called beds, that also represent extremely flat and widespread depositional forces as expected for the Flood. 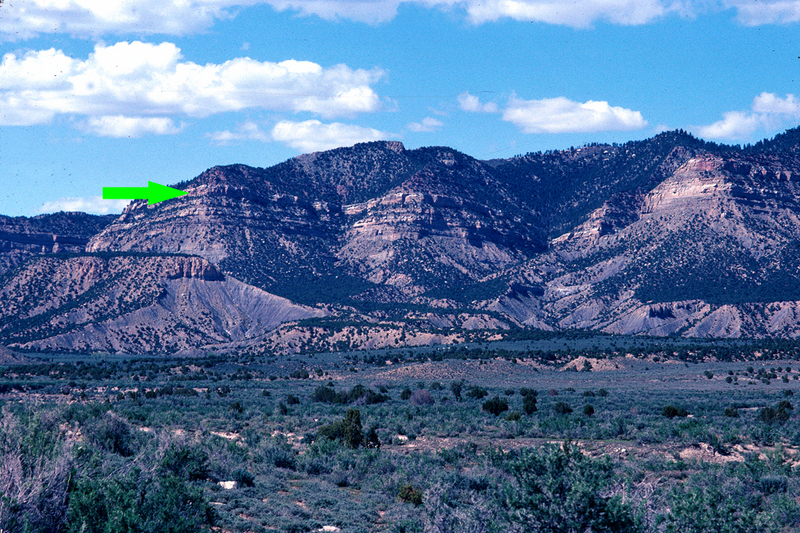 The arrow in Figure 4 points to the flat layer called the Castlegate Sandstone of the Price River Formation. As you travel east from Price Utah, near where it originated, into Colorado, you can follow that sandstone unit for 160 kilometers. 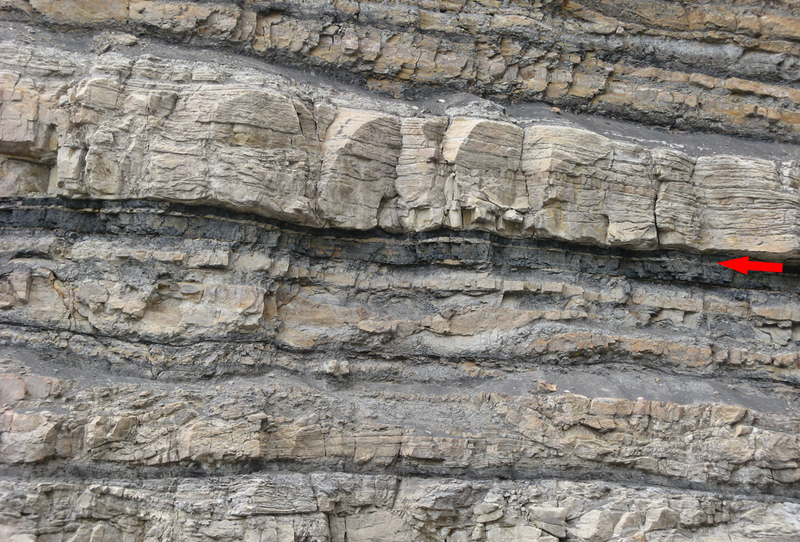 Another example is seen in coal seams where thin layers of grainy sediments called partings can be found (Figure 5). These are in the centimeters range in thickness but can be incredibly widespread. When you start studying the incredibly widespread distribution of the geologic layers, you soon begin to realize that the conditions for their deposition are often strikingly different from what occurs for present local geological activity, and that widespread distribution is as would be expected from the catastrophic Flood described in the Bible. Adding further evidence for rapid deposition, as expected for the Flood, is that where significant parts of the geologic column are missing between layers, the evidence for the deep erosion expected over millions of years of no deposition postulated by geologists is missing. [See the article Flat Gaps Challenge Long Geologic Ages] For instance, between the Morrison and the Cedar Mountain Formations (Figure 2), layers representing a postulated 20 million years of evolutionary time are missing at this locality. During that time, an average of 600 meters of erosion of the surface of that gap would be expected. [vi] Erosion as seen in modern environments is dominantly irregular, however, the contacts between the two formations mentioned above are incredibly flat permitting one thin formation to be laid on top of the other. These flat gaps, which are found in numerous localities around the world, provide rather convincing evidence that the long geological ages never occurred. [vii] Figure 6 (above) illustrates three examples of flat gaps (called paraconformities or disconformities) between the layers of the Grand Canyon. At the lowest arrow, the Ordovician and Silurian periods of the geologic column are missing, yet the contact line is incredibly flat in most of the Grand Canyon. During the 100 million years assumed for that flat gap, one would expect an average of 3 kilometers of erosion. 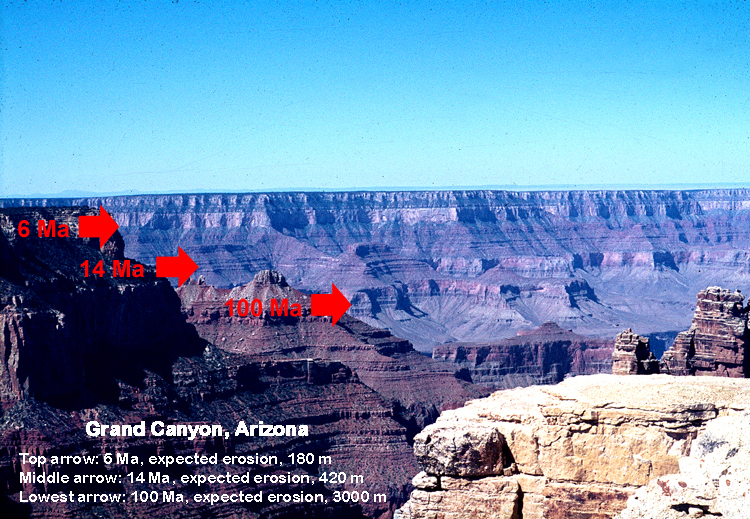 For comparison, note that the Grand Canyon is only 1.5 kilometers deep. There are other major features of the geologic layers that favor the Flood. Our continents literally float on top of heavier rocks, and this keep them above sea level so we have dry land to live on. However, when you look at the rock layers (sediments) on the continents, more than half of them come from a marine environment. [viii] For example, two thirds of the layers in the Grand Canyon (Figure 6, above) are limestones and shales of marine origin. What is so much material of ocean origin doing on the continents? This is as would be expected from a worldwide Flood as the oceans flooded the continents and deposited marine sediments well onto the interior of the continents. Furthermore, study of the Paleozoic sediments over the North American continent indicates that their direction of transport was almost consistently orientated towards the southwest on a continental scale. [ix] This coherent large-scale direction is as would be expected for a major worldwide catastrophic event such as the Flood, but not at all for slow deposition over the long geologic ages, as rivers, streams and currents would deposit sediments in all directions. These “immense and incredibly flat” areas of the world are what would be expected from the great catastrophic Flood, but not from slow local deposition of sediments as the continents slowly moved around and up and down over billions of years as postulated by geologists who do not conceptualize the biblical Flood. There are many interpretations about the amount of time involved with the formation of various parts of the geologic record of the earth. A long list of local interpretations on both sides of the Bible-science controversy could be presented. [xi] Unfortunately, at present, the scientific community does not accommodate the biblical model of the Flood in its journals and textbooks. Instead these publications have many endorsements for the long geological ages but not for the biblical model. The Flood question is not approached from the perspective of a level playing field. However, one does not have to abandon science in order to believe the Bible. The incredibly widespread flat sedimentary formations and the layers within them, the lack of evidence for long ages at the flat gaps between sedimentary layers, and the abundance of material from oceans on the continents are powerful worldwide factors that very much favor the Flood model of the Bible. This is data that is difficult to explain outside the biblical model of origins. [i] For examples and references see: Roth AA. 1998. Origins: Linking Science and Scriptures. Review and Herald Publishing Association, p 303-307. [ii] For examples of some widespread conglomerates see: Stokes WL. 1950. Pediment concept applied to Shinarump and similar conglomerates. Bulletin of the Geological Society of America 61:91-98. [iii] Austin S. 1979. Evidence for marine origin of widespread carbonaceous shale partings in the Kentucky No. 12 Coal Bed (Middle Pennsylvanian) of Western Kentucky. Geological Society of America, Abstracts With Programs 11(7):381-382. [iv] McKee ED, Resser CE. 1945. Cambrian History of the Grand Canyon Region. Carnegie Institution of Washington Publication 563:26-28. [v] Brett, CE. 2000. A slice of the “Layer Cake”: The paradox of “Frosting Continuity.” PALAIOS 15:495-498. [vi] For calculations and references on rates of erosion see: Roth AA. 1998. Origins:Linking Science and Scripture. Review and Herald Publishing Association, p 263-267. [vii] For further explanation and more examples see DISCUSSION 16 and or VIDEO 13 on the authors webpage www.sciencesandscriptures.com, Also: Roth A. A. 1988 “Those Gaps in the Sedimentary Layers”, Origins 15:75-92 (www.grisda.org). For a briefer version and more discussion points see A. A. Roth. 2009. “Flat gaps” in sedimentary rock layers challenge long geologic ages. Journal of Creation 23(2):76-81. The topic is also discussed in Roth AA. 1998. Origins: Linking Science and Scripture. Review and Herald Publishing Association, p 222-229. [viii] Shelton J. S. 1966. Geology illustrated. W. H. Freeman and Company, p 28. [ix] Chadwick AV. 1993. Megatrends in North American paleocurrents. Society of Economic Paleontologists and Mineralogists Abstracts With Programs 8:58. [x] Newell ND. 1967. Paraconformities. In Tichert C, Yochelson L, editors. Essays in paleontology and stratigraphy. Department of Geology, University of Kansas Special Publication 2, p 355. [xi] For some examples, see DISCUSSIONS No. 8 and 9, Questions About a Recent Creation, and Scientific Data that Favors a Recent Creation, on the authors’ webpage: www.sciencesandscriptures.com [link? ]; Roth AA. 2012. The Genesis Flood and the geological record. In Ball BW, editor, In the Beginning: Science and Scripture Confirm Creation. Pacific Press, p 220-237; Roth AA. 2011. Can I Believe in a worldwide Flood? In Gibson LJ, Rasi HM, editors, Understanding Creation: Answers to Questions on Faith and Science. Pacific Press, p 123-132; Chapters 12-15 in Roth AA. 1998. Origins: Linking Science and Scripture. Review and Herald Publishing Association.